Watch a short clip about everyday life for a young boy in Roman Britain. Meet a Roman soldier and find out what his life would have been like. See how Romans may have lived in a supply fort on Hadrian's Wall in Roman Britain. Find out about the ancient Colosseum in Rome. Each page is illustrated with scenes from Roman life, plus photographs of Roman artefacts such as mosaics, statues, carvings and coins. Perfect for readers who prefer fact to fiction and those studying the Romans at school, with internet links to specially selected websites with video clips and more information. 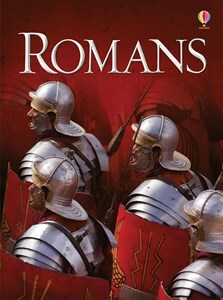 This book tells us all about Romans who lived hundreds of years ago. I like the bit where it tells you that the owners swapped places with the slaves for the day... like the Usborne Beginners books because they tell you about a lot of interesting things, and the pictures are nice, some look real, some are drawn and others are cartoons. Great book for my school project. Lots of interesting facts. This book was full of fun ideas! It has a lot of information so you learn about it more. The best bit is the website www.usborne-quicklinks.com it is the BEST!